70s-style Traynor Bass Master YBA-1A Mark II. Look at how small the Hammond 274BX replacement power transformer is compared to the footprint of the original Hammond PT that used to be there. This seems normal for Hammond transformers of today to have same or better specs but be much smaller than the old 60s 70s transformers. 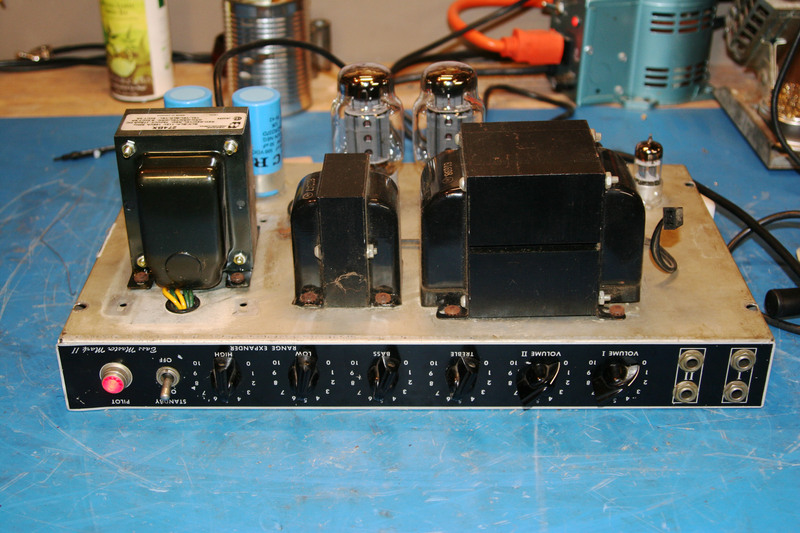 Original power tubes in this amp are 6CA7 but the owner likes to use KT88 and use it for bass. Original Traynor YBA-1 used 7027 which has 0.9A heater current draw per tube, but when you switch to 6CA7 or KT88 the heater current draw is 1.5A per tube. So adding in the three preamp tubes at 0.3A each current draw per tube this amp is has a 3.9A heater current draw. With original 7027s it would have been only 2.7A total. This is the main thing to be concerned about switching power tubes in an amp. If the power transformer can’t handle the extra heater current it will get really hot and eventually fail. You could see how this would be a bigger issue with four power tube amps because switching from 6L6 to 6550 for instance would increase the heater current draw in the output section alone from 3.6A to 6A, which is a big jump! Anyway, 274BX is a fine choice since it is rated for 6A heater current. I guess the other thing that is important when switching to big tubes is physical space. The power tube sockets on this amp are too close together so the KT88s are probably heating each other a bit, but I guess it gets away with it. Ideally there would be more room between the two power tubes so there is better airflow and heat dissipation. This amp was designed to have 7027 power tubes which are not as wide so I guess it would not have been such an issue with the original tubes. Inside the chassis someone has replaced the original bias trimpot and also recapped the amp by drilling the chassis and installing clamps to hold the capacitors. Drilling a steel chassis is not that fun and some people would get mad if you did it, but it’s probably the best, neatest way to do it. It’s a little more expensive because you have to buy the caps and the clamps to hold them. If you’re lucky like me you have access to an air compressor to try to blow all the metal debris out of the chassis after drilling. Don’t be a bum and leave it in there. Even if you have to hold up the chassis up and blow into it. Close your eyes before doing so in case of flying metal debris. 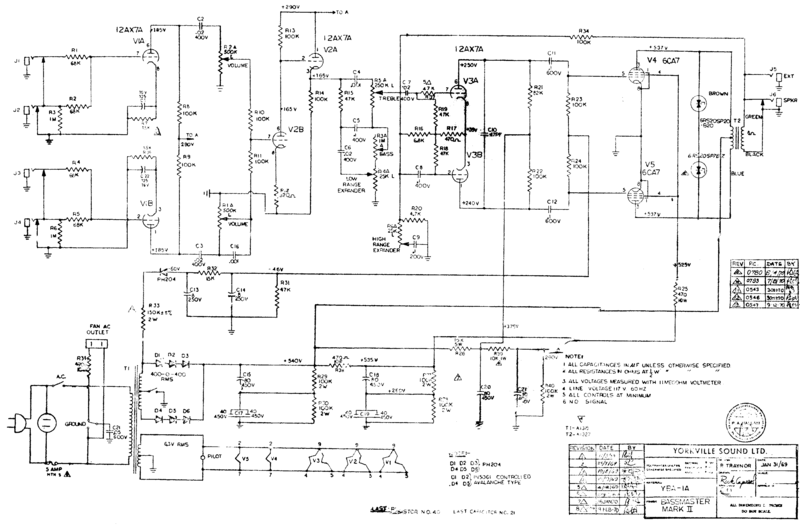 Traynor Bass Master YBA-1A MKII schematic. 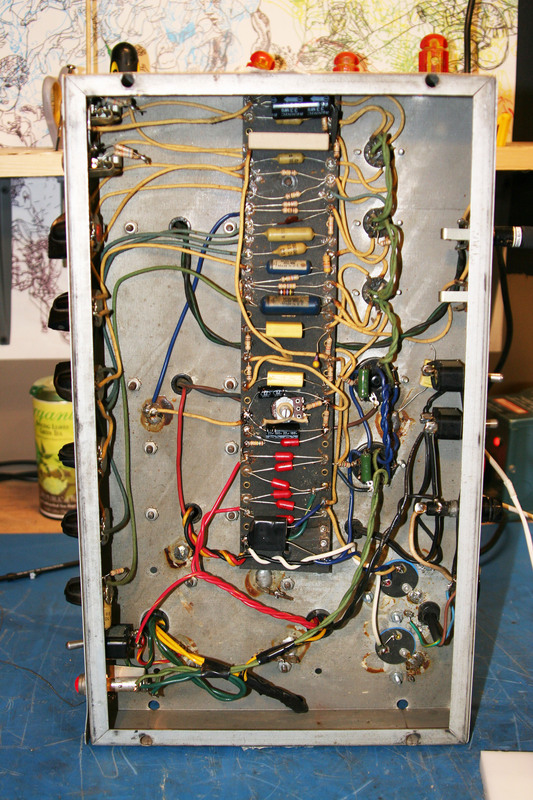 So as you can see, this YBA-1A MKII has 537V B+ for the power tubes. With this B+ it will do about 65W at clipping. Original Traynor YBA-1 from the previous post only has a 430V supply and will do about 40W at clipping. Check out the flyback diodes they have going from plate leads of the power tubes to ground. They are listed as what seems to be 6RS20SP20820 and 6RS20SP787 and are actually called thyrectors (6RS20SP series). They are selenium and should be probably just be removed or replaced. They will eventually fail because selenium rectifiers increase in resistance over time. So as the decades go on they run slightly warmer and warmer, until they usually short. Selenium is toxic and burnt/eploded/releasing the smoke selenium rectifiers should be avoided. You can just replace them with those R3000 diodes or three 1N4007 in series.